Watching Sunday night’s presidential debate was at best a trying experience. Without really realizing it, I think many of us had expected Donald Trump to show up and self-destruct in the face of overwhelming adversity. Instead, we forgot the number-one rule of nature: An animal can be its most dangerous when it is threatened. Trump, backed up to a cliff edge by his opponent Hillary Clinton, the media, and even his own party, lashed out in every direction. But by far, the most difficult parts of Sunday’s debate were the moments when Trump attempted to paint Clinton as a racist, pro-wealthy, anti-feminist opportunist, essentially attributing to her all of his own worst qualities. It’s a cynical, desperate, and downright evil ploy, but it’s also brilliant. Even if Trump loses the election, he will definitely win the title of 2016’s Evil Genius award. The gambit is hardly a new one for the Trump campaign. In last Tuesday’s vice presidential debate, Republican Mike Pence made the outlandish claim that Clinton was running an “insult-driven campaign,” even while Trump tweeted out an insult about Democratic vice presidential nomineeTim Kaine. The argument reached its fever pitch Sunday, when Trump claimed outright that Clinton “has hate in her heart,” and put her in the bizarre position of having to reiterate all of the non-hateful things she has done. The stratagem is downright Orwellian in its attempts to divorce perception from actuality — and no less disturbing for the readiness with which so many of Trump’s supporters have gleefully signed on. Before I go on, it’s important to acknowledge that the thing that makes the worst lies so pernicious is that they’re a little bit true. Clinton has said racist things in the past, and has been supportive of financial policies that have benefited Wall Street. Tapping into preexisting Clinton hatred is part of what gives Trump's ploy legs, despite the blatant and painful evidence that it is in fact Trump who has embraced racism, sexism, and anti-middle-class policies. The reason the plan is so nauseatingly brilliant is that it kills two birds with one stone, simultaneously indicting Clinton while exculpating himself. Trump can’t be racist/sexist/Monty Burns because Clinton is! It’s also an incredibly audacious maneuver, and it’s unclear if it will have any purchase beyond his base. 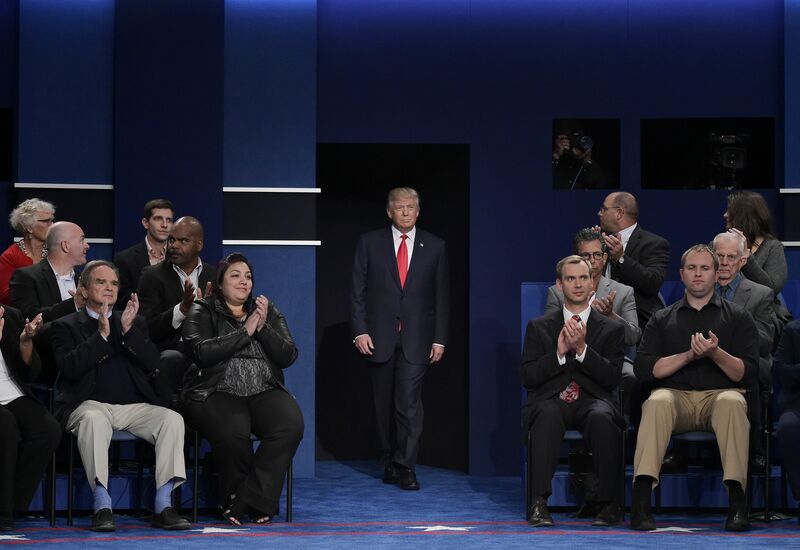 Certainly, judging from the facial reactions of some of the supposedly undecided voters in the audience last night, Trump’s scorched earth approach wasn’t working with them. They seemed to see that Trump’s number-one priority is always Trump, and he made it clear last night that he’s willing to step on anyone to survive, including his own running mate. Once the debate was over, my panic ebbed and my heart rate returned to normal, and I was able to see that Trump’s nightmarish performance hadn’t quite achieved the aims I thought it might. In the sobering light of day, it almost seems like Trump is reverting to what many hypothesized he was doing when his campaign was tanking back in August and setting himself up for a post-election television network. With this latest pantomime for his base, it seems like Trump TV might become a reality after all — though, thankfully, not a Trump presidency.